As experts debate the resonance of the sustainability movement within the corporate structure and the marketplace, non-profit organizations are turning to social media to further their goals. Earlier this year at TEDxCERN — a partnered TED Talk informational event held at CERN, the world’s largest particle physics laboratory — scientist Chris Lintott spoke about the concept of crowdsourcing scientific discoveries. Through such projects as GalaxyZoo, which allows citizens to assist in the classification of newly discovered galaxies, tedious research busywork can be accomplished in short order via viral outreach. Case in point: Last month, a team at CERN outsourced some analysis through the site CrowdCrafting, whereby volunteers could help to decipher particle accelerator collision data. "Humans are way better at interpreting the particle tracks than machines so the AEgIS team needs your big brains and keen eyes to map the particles’ path through the emulsion," their request explained. "All you have to do is join the dots!" The volunteers blew past the needs of the scientists within days. In a piece for The Guardian, James Georgalakis explained how his team's work at the Institute for Development Studies — using social media outreach efforts — led to increased awareness of their unsung, upstart metric for measuring countries' commitments to ending world hunger. We had carefully targeted key influencers on Twitter and key bloggers. Some of these were project partners, others were organisations we had identified through our stakeholder mapping as having a shared advocacy or research agenda. We shared with these networks advance links to our assets, including an infographic, a website and a short animated film. We met with them, briefed them in nutrition network meetings or simply fired off an email a few days ahead of the launch asking them if they could help. Once the launch was underway, we also tweeted messages to some of our key followers. The result of this strategy was that even if Hanci failed to make the grade in the newsroom, it was an instant hit on Twitter and in the blogosphere. Within hours of HANCI going live, well-placed government officials from several countries were tweeting about their interest in & the inherent worth of the index. The top five tweets and retweets alone received more than 134,000 potential impressions. Never one to shy away from grassroots mobilization tactics, nonprofit behemoth Greenpeace has been playing the social media game, as well. Their most recent high-profile project is Save the Arctic, which exists to raise awareness about the continuing loss of habitat and sea ice — all to the economic benefit of oil corporations — in the Arctic Circle. Greenpeace has engaged citizens and celebrities alike throughout the campaign, as it has organized cheap, highly visible protests with a focus on art and culture jamming. Their "I ♥ ARCTIC" awareness effort culminated on 20 April 2013, which saw connected individuals and groups from across the globe uniting via social networks to show their support for the movement. On 11 July 2013, six women defied security and scaled the outside of a 1,016 ft. skyscraper in London as part of the campaign. It was widely covered by traditional media outlets, but Greenpeace hyped the event with the use of an #iceclimb Twitter tag. Once again, Greenpeace has captivated social media with Aurora, the giant polar bear puppet. 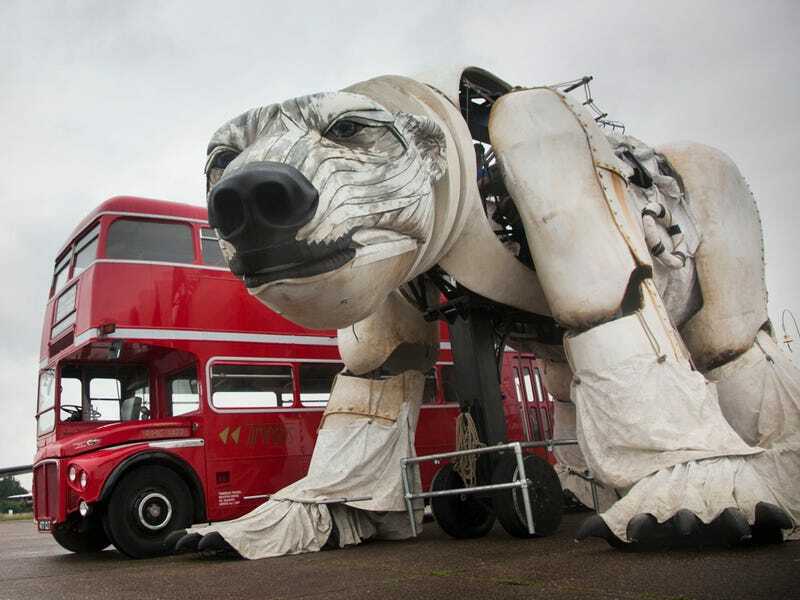 The 3-ton marionette will roam and roar through the streets of London this weekend as part of Greenpeace's worldwide Ice Ride event on 15 September. Providing the ursine gutturations will be the lead singer of Portishead, a popular music duo from the UK, which has led to the event being hyped on music blogs across the web. Aurora's thumpy trundle can be followed via #ICERIDE. While the data regarding the zeitgeist of the world's populace can be hard to quantify, the reblogs and retweets tell a very interesting story. Socially aware media is here, and it's ready to share.